Author(s): Diana Boraschi, Institute of Protein Biochemistry (IBP), National Research Council (CNR), Via Pietro Castellino 111, 80131 Napoli, Italy. Paola Italiani. The thorough understanding of the interaction between nanomaterials and the immune system is the starting point both for nanomaterial exploitation in nanomedicine and for the implementation of an effective regulatory framework concerning nanosafety for human health and the environment. In this context, the use of valid models, in vitro and in vivo, is central for assessing both the positive and the detrimental effects of nanomaterials, thereby predicting their possible risks for human and environmental health. Thus, predicting models are sought that allow us on one side defining hazard posed by nanomaterials, and therefore implementing safety regulation and safe-by-design nanotechnologies, and on the other side exploiting nanomaterials for more effective therapeutic and preventive medical strategies. Here, we consider the advantages and limitation of the current in vitro and in vivo human and animal models, and the appropriateness of their use for assessing the effects of nanomaterials on immunity. Keywords: Innate immunity, inflammation, nanomaterials, human, animal, in vitro, in vivo, safety. Keywords:Innate immunity, inflammation, nanomaterials, human, animal, in vitro, in vivo, safety. Abstract:The thorough understanding of the interaction between nanomaterials and the immune system is the starting point both for nanomaterial exploitation in nanomedicine and for the implementation of an effective regulatory framework concerning nanosafety for human health and the environment. In this context, the use of valid models, in vitro and in vivo, is central for assessing both the positive and the detrimental effects of nanomaterials, thereby predicting their possible risks for human and environmental health. Thus, predicting models are sought that allow us on one side defining hazard posed by nanomaterials, and therefore implementing safety regulation and safe-by-design nanotechnologies, and on the other side exploiting nanomaterials for more effective therapeutic and preventive medical strategies. 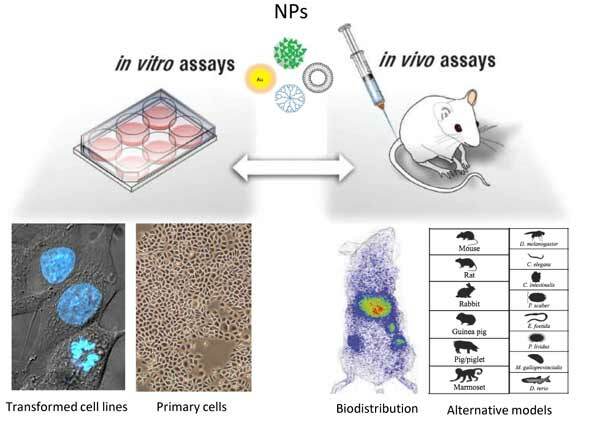 Here, we consider the advantages and limitation of the current in vitro and in vivo human and animal models, and the appropriateness of their use for assessing the effects of nanomaterials on immunity.